Daddy’s Home! 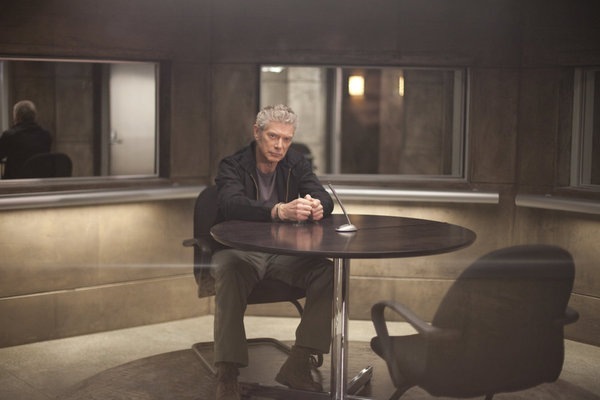 Stephen Lang On Playing Mary Shannon’s Long Gone Father On In Plain Sight! Ever since In Plain Sight [USA Network, Fridays, 9/8C] premiered, we’ve known that Mary Shannon’s father was a criminal who abandoned his family when she was seven years old. Last week, James Wylie Shannon [Stephen Lang] turned up at Mary’s house in the episode’s final moments – and she promptly arrested him – leading up to a two-part arc for the character. Earlier this week, Stephen Lang spoke with a group of journalists/bloggers about the unique challenges of playing the senior Shannon. He proved himself to be a gentleman – diplomatically handling technical difficulties and some silly questions with aplomb. He also proved to be intelligent, incisive and witty. It was a thoroughly enjoyable call. It’s In Plains Sight’s Final Season – Stars Mary McCormack And Fred Weller Dish! USA Network’s In Plain Sight [Fridays, 10/9C] begins is fifth and final season this week. Will Marshal Marshall Mann and Marshal Mary Shannon get together? How will the decidedly non-maternal Marshal Mary Shannon deal with actually being a mother? What will series stars Mary McCormack and Fred Weller remember most fondly – and what souvenirs are they looking to grab at season’s end? Earlier this week, Mary and Fred spoke with a group of journalists/bloggers about these questions and so much more. In Plain Sight’s Mary McCormack and Frederick Weller Talk Unrequited Love, Babies and the Fourth Season Finale! This week I had the opportunity to take part in a conference call Q&A with Mary McCormack and Fred Weller in support of the fourth season finale of their USA Network series In Plain Sight [Sunday, 10/9C], Something Borrowed, Something Blew Up. There were some technical issues that made the call a free-for-all rather than the usual, well moderated discussion, but Mary and Fred were as personable and cheerful as ever. In Plain Sight’s New Showrunners Talk the Pluses and Minuses of Taking Over an Established Series! On Thursday, I had the opportunity to take part in a teleconference Q&A with John Straus and Ed Decter, who have taken over the reins of USA Network’s In Plain Sight [Sundays, 10/9C], which is now in its fourth season. We talked a bit about their background, and a bit about coming into a established series as showrunners – and got an idea of what we can look forward to during In Plain Sight’s fourth season. After you check out what they had to say, catch this week’s episode, Crazy Like a Witness, guest-starring Bradley Whitford as a paranoid ex-military man who’s blowing the whistle on a Blackwater-type company. And remember, just because you’re paranoid, that doesn’t mean they’re not after you. In Plain Sight – It Takes a Thief to Explain a Thief! For its fourth season, USA’s In Plain Sight [Sundays, 10/9C] returns to its original timeslot with an episode that is a bit of a departure. The Art of the Steal finds Marshal Mary Shannon fearing that her sister, Brandi, has become involved in grand theft auto [again!] – and seeks advice and insight from a car thief in the WITSEC program in Albuquerque. 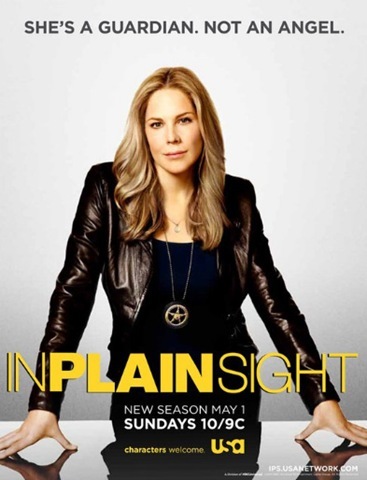 Mary McCormack and Fred Weller Speak to the BIG Changes This Season on In Plain Sight! 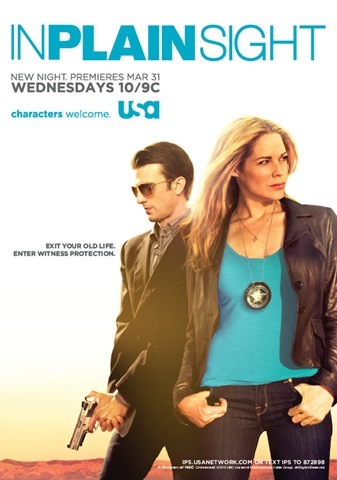 When USA Network’s hit series In Plain Sight [Sundays, 10/9C] returns this weekend, it marks a sea change in the life of its female lead, Deputy U.S. Marshal Mary Shannon [and we all know how much Mary loves change… not!] – plus plenty of pithy commentary on the subject of change by her partner, Deputy U.S. Marshal Marshall Mann [who has a big change in his life, as well…]. For the fourth consecutive year, I had the opportunity to take part in a teleconference Q&A session with series stars Mary McCormack and Fred Weller about the upcoming season. For the comedy stylings of McCormack & Weller, just follow the jump. 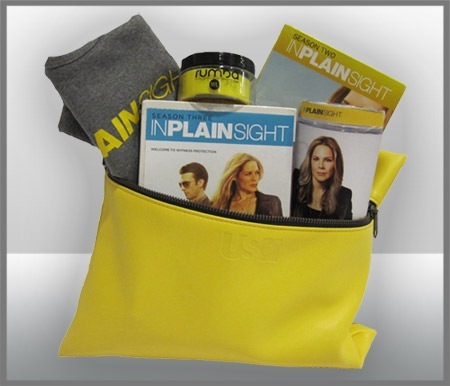 CONTEST: Win a Prize Pack of In Plain Sight Goodies! In the fourth season premiere of USA Network’s In Plain Sight, Mary uses a thief to catch a thief when she asks a witness to consult on a crime in order to exonerate Brandi of grand theft auto – plus, Marshall has a girlfriend! 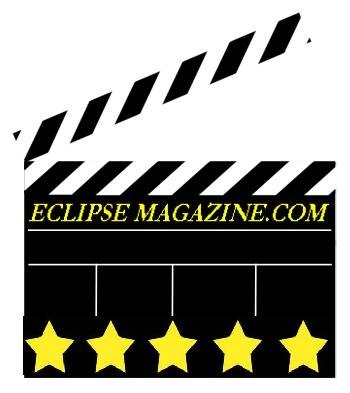 Catch In Plain Sight – The Art of the Steal – on a new night: Sunday, May 1st at 10/9C – then come back to Eclipse to win a prize pack worth $130. Contest rules and prizing follow the jump. 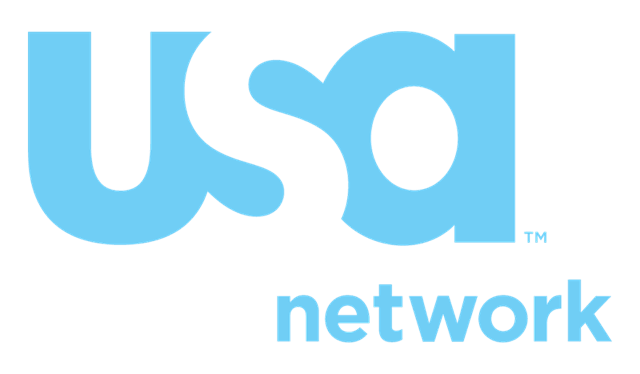 USA Network Locks Up Summer! USA Network isn’t resting on its laurels. The number on-rated basic cable network is bringing a solid mix of new and returning programs to its summer schedule. Following Sunday’s premiere of Burn Notice: The Fall of Sam Axe, new shows Necessary Roughness and Suits will join returning favorites like Burn Notice, Royal Pains, In Plain Sight, White Collar and last year’s rookie success, Covert Affairs on USA’s schedule. For season premiere dates and show synopses, check out the USA Network press release following the jump. Following on the heels of the The USA Networks renewal of Burn Notice, In Plain Sight, Covert Affairs and the final season of Law & Order: Criminal Intent, they continue to keep viewer favorites in their television line up by announcing that they have renewed Psych, Royal Pains and White Collar. Psych will kick off the second half of its fifth season in November, while Royal Pains and White Collar return in January. Over at the Lifetime Network, Army Wives and Drop Dead Diva have both been renewed: Army Wives for its fifth season and Drop Dead Diva for its third. HOLLYWOOD INSIDER: Liz Phair Talks About Scoring In Plain Sight But Not About Her Novel! Say what you will about cable networks going all out to promote their original programming, but if ABC had been half as vigorous Promoting FlashForward and V as USA has been about promoting In Plain Sight, maybe those shows would be enjoying better ratings success. Over the last several days, I’ve had the opportunity to take part in two teleconference Q&A sessions in support of USA’s In Plain Sight [Wednesday’s, 10/9C]. 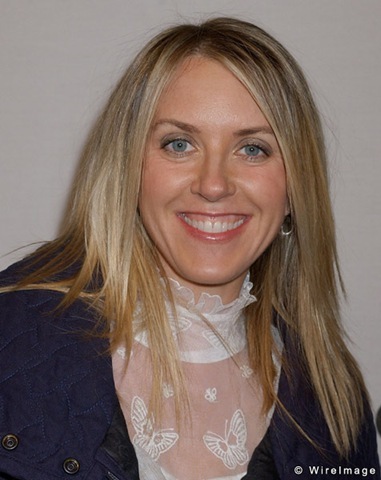 In this case, the subject is Liz Phair who is part of the new three-person team that composes the scores for the series. [If you thought that the show’s score was edgier than before, that might be why]. HOLLYWOOD INSIDER: Mary McCormack and Fred Weller on Season Three of In Plain Sight, Tony Award Nominations and More! In Plain Sight [USA, Wednesdays, 10/9C] is a unique series – even for USA where the motto is Characters welcome. The lead is a strong, cynical woman [Mary Shannon, played by Mary McCormack] who, along with her partner [Marshall Mann, played by Fred Weller], works for the U.S. Marshals in the Witness Protection Program [WITSEC]. It’s a unique job in that Marshals in WITSEC can’t talk about their jobs away from work. People’s lives depend on that. McCormack and Weller make a very good team on the show – and their chemistry is palpable even off screen – as this teleconference Q&A shows.